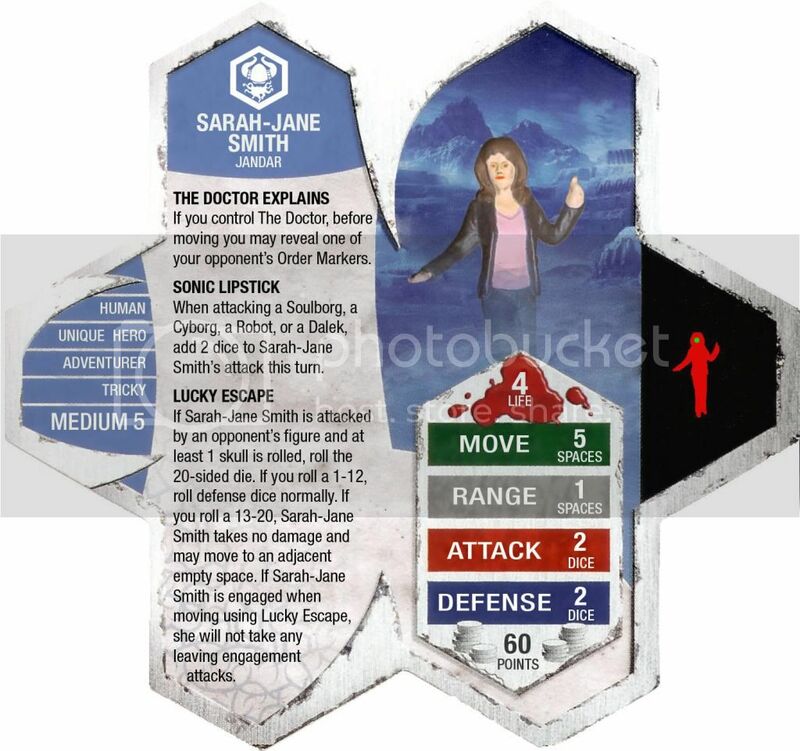 Some time ago I got one of those 7 pack of Dr Who Micro Universe figures & I have been meaning to do some custom cards for them but just been too slack. Today I decided to start, so here is where they will go when completed. This is the first custom for the moment. There will be more to come. Thanx to Dragonranger for inspiration on some of the specials. Thanx for looking & any feedback you provide. Last edited by A3n; March 8th, 2015 at 09:18 AM. Two 30% chances per activation to auto-destroy ANY hero? Two guaranteed chances to destroy squad figures? Although massive, you'd hardly ever use their normal attack. 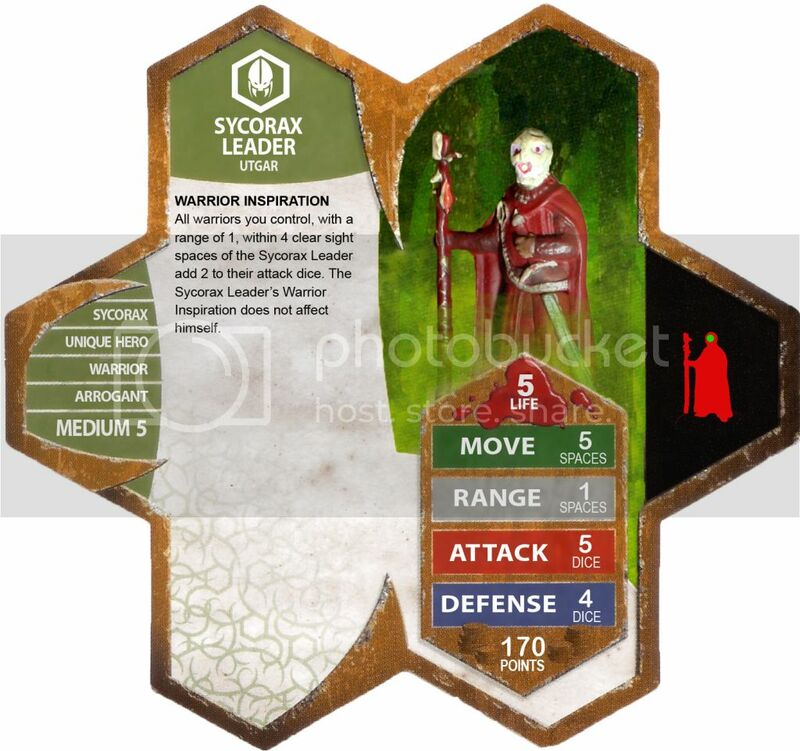 These guys are pushing the limits of the Heroscape game engine in terms of power. Even at 210 points, they are undercosted. Two 30% chances per activation to auto-destroy ANY hero? Two guaranteed chances to destroy squad figures? Although massive, you'd hardly ever you their normal attack. I hear what you are saying but I am trying to be thematic, but of course I don't want to break the game. What about if I take it down to a 20% chance, dropped the range to 3 spaces & up the normal attack range to 6 to compensate a little, would 240 points be appropriate then? 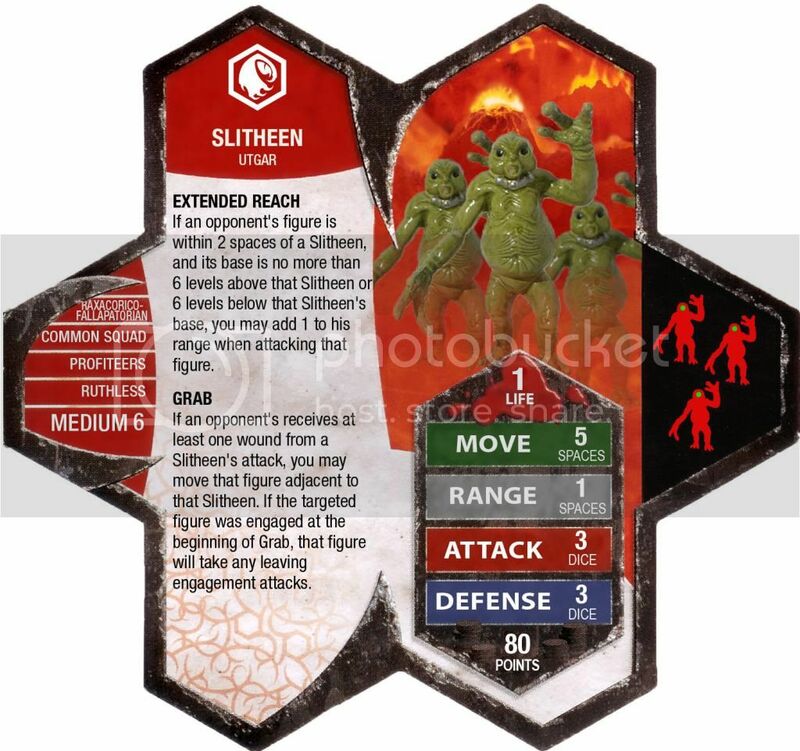 Sudema does virtually nothing but take a 65% to destroy a single squad figure or a 20% chance to destroy a hero from 4 spaces. She's 140 points and extremely fragile at 4 life and 3 defense. Your guys could guarantee two squad kills per turn or take two chances at killing a hero. They are also about 6x as durable and are common. I have no idea what they are worth, but it is more than even the most expensive Marvel figures. I mean this only as constructive criticism - the abilities you've chosen are neat, but they need to be toned down in terms of degree to make the figures balanced. True. I was more or less thinking along the lines that their armour is impervious to all non explosive attacks, but again not to break the game I have adjusted the armour but increased the defense & cost. I actually haven't seen Sudema before, as I was using Grimnak as my comparison. 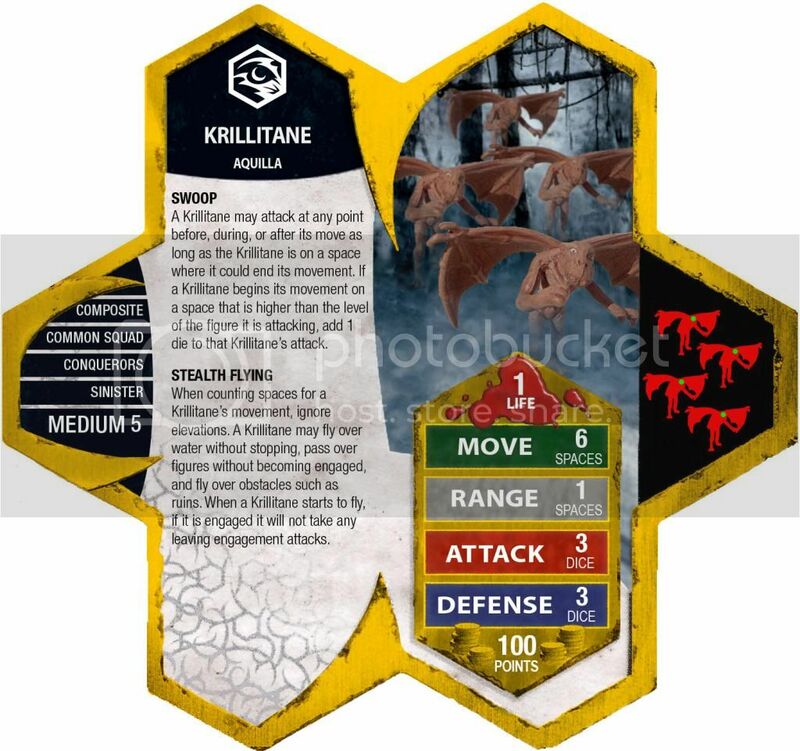 He gets to Chomp & do a normal attack. Remembering also that unlike Sudema's Stare of Stone but like Grimnak's Chomp my Exterminate! Exterminate! Exterminate! 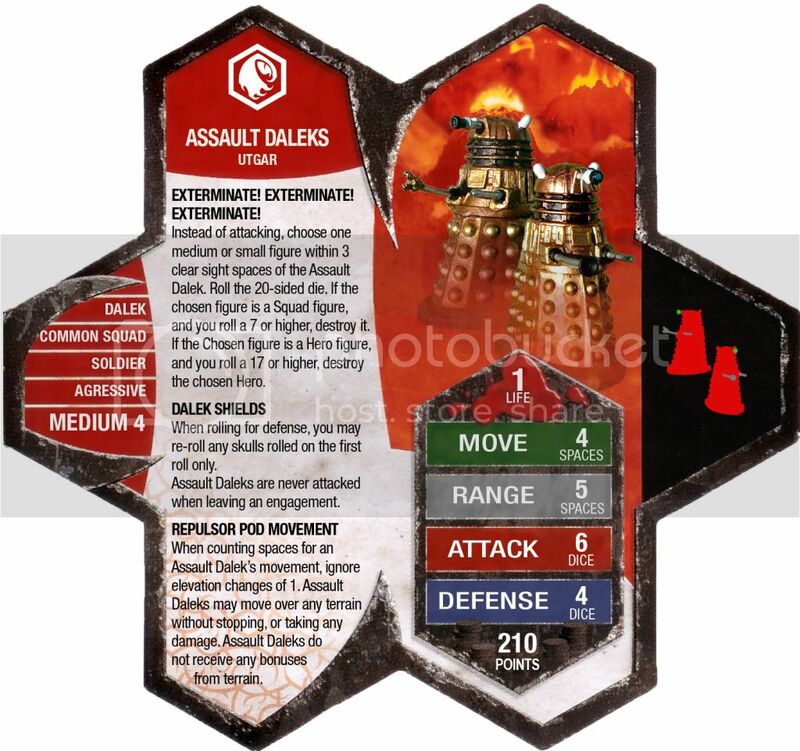 only targets small or medium figures & the Daleks only have a combined life of 2. 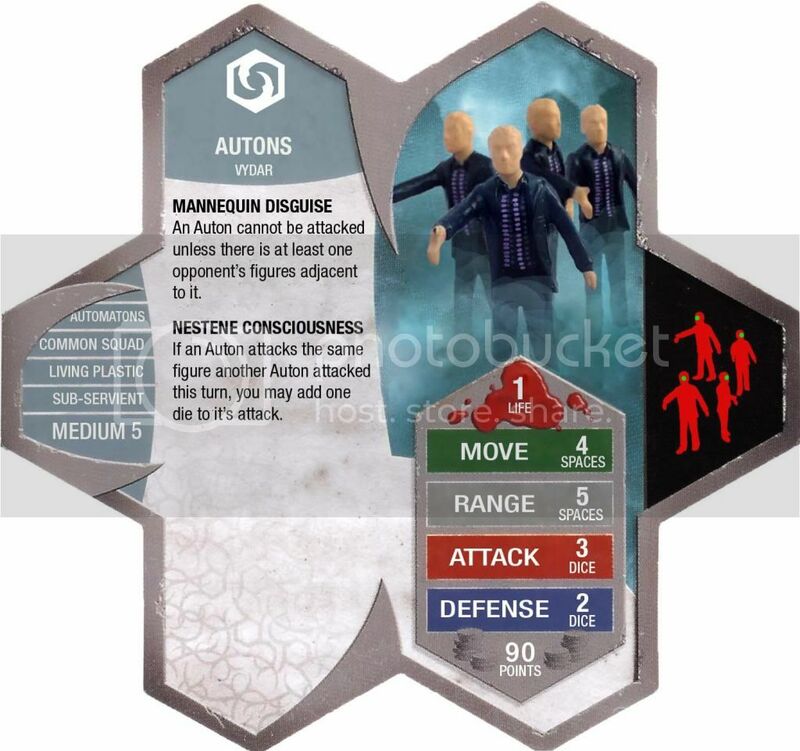 I feel a small or medium squad member is just cannon fodder to a Dalek's Disintergration ray & giving up a 6 attack for only a 30% chance of destroying a small or medium Hero was a valid trade off. I thought anything lower than 30% was never going to be used which would kill the Dalek's theme, but I accept all criticism which is why I wanted to have the discussion about going lower & increasing range & cost. If my customs are off in any way please give me a suggestion on how to make it better & I will certainly consider it or at the least start a discussion about it. I think we all win if we help each other get our customs right, and that's all I'm aiming for here. I would think that the Cybermen move value is too high... they're the slowest things ever. Doctor Who can just run past the things. I also think that four special powers is too much for any characters. Most in the store-bought sets only have 1 or 2. 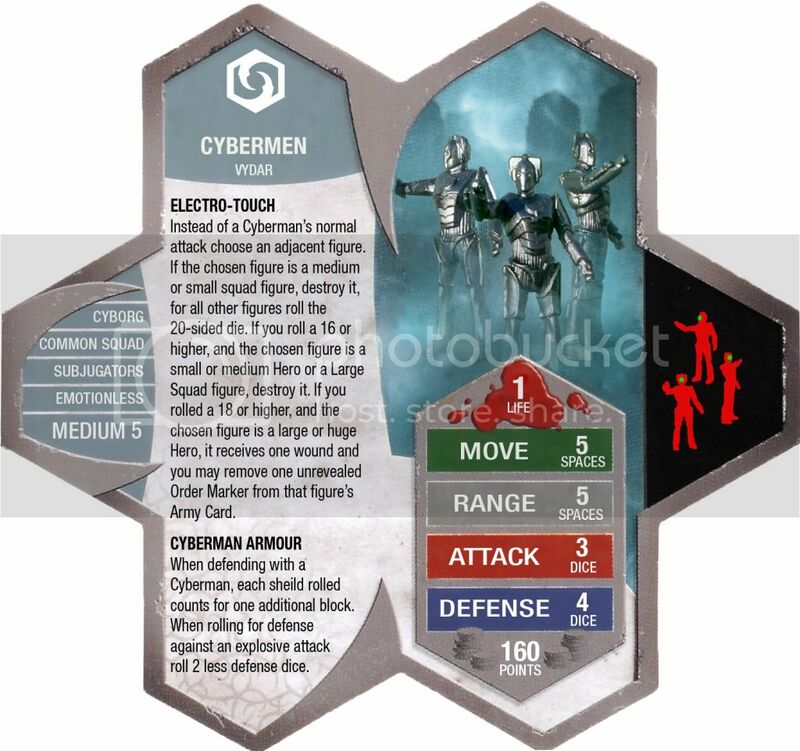 In the case of the Cybermen, one special power has a 25% chance of killing a hero, and another special power lets the user take control of an opposing unit. Seems like the powers are a bit stacked. All in my opinion, of course. After a play or two with these units, you'll get a good feel of the balance or any lack of it. Keep up the good work!! 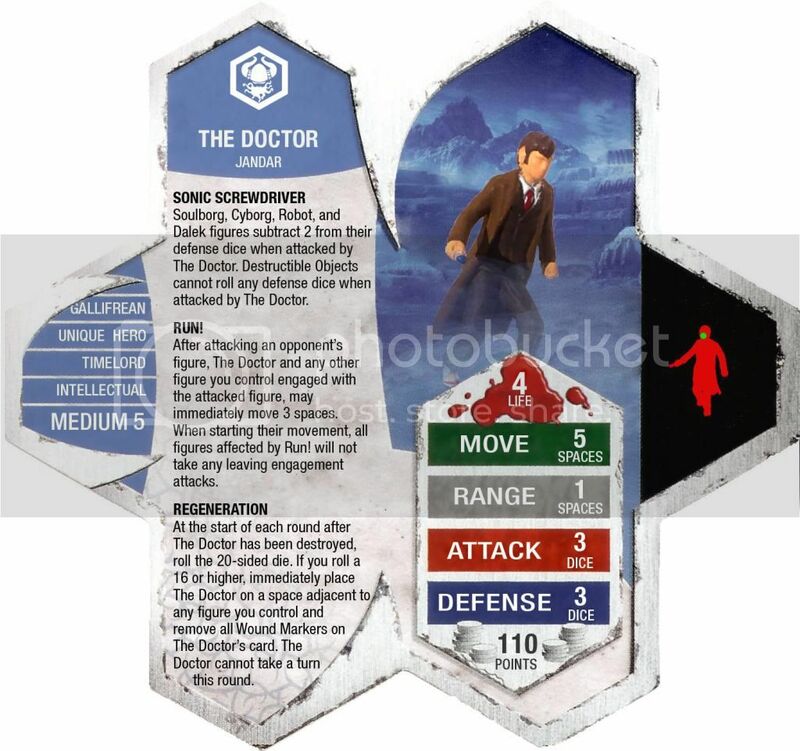 I'm a huge Dr. Who fan so I love that you are doing these customs. Right now, though, I'd say they are overpowered for HS. For Dr. Who they are right on. Sometimes it is hard to import characters from movies, comics, TV, etc. and keep them thematic but not broken. HS Codex 6 has a good article on this customs philosophy. I'd recommend giving it a read. You can get it here. No dragon has ever swooped down behind them and knocked them over face first in the TV show. Imagine if Charos did this. How easy would it be for a Cyberman to get back up? 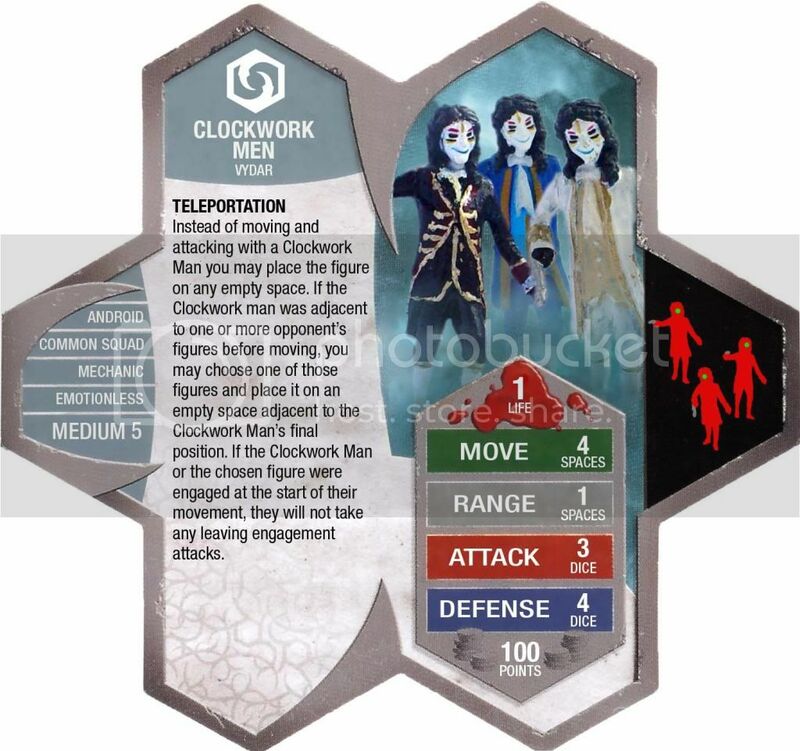 In other words, don't look at the perfectly scripted world of Dr. Who to develop them as HS figs. Think of what could happen in a real battle (I just referred to a dragon knocking over a robot as a real battle... I need to take a break from this game). BTW, exactly what figs were in the pack you got and where did you get it. I didn't even know Dr. Who minis existed. Anyhow, you are off to a good start. Hope the Codex issue offers you some insight. Keep the faith and As was Said "Play test them" I made up the Drow from DND and I had to eliminate Invisibility, Globes of darkness and Levetation, before I even made up the card and people still complained they were too powerfull. It is hard to bring in people from movies or books. Their main weekness is movement in the old series often running up or down some steps could save you from a Dalek. Ok, lets see if I'm any closer with the Cybermen. I have reduced the percentage chance on Large & Huge Heroes. I removed the Cyber-Conversion skill (which IMO was pretty cool - but granted unnecessary for the Cybermen, maybe for a Cyber-Leader or the ship Cyber-King ), & reduced their normal Attack & Defense by 1. For the Daleks I have reduced the range of Exterminate! Exterminate! Exterminate! & decreased the percentage. 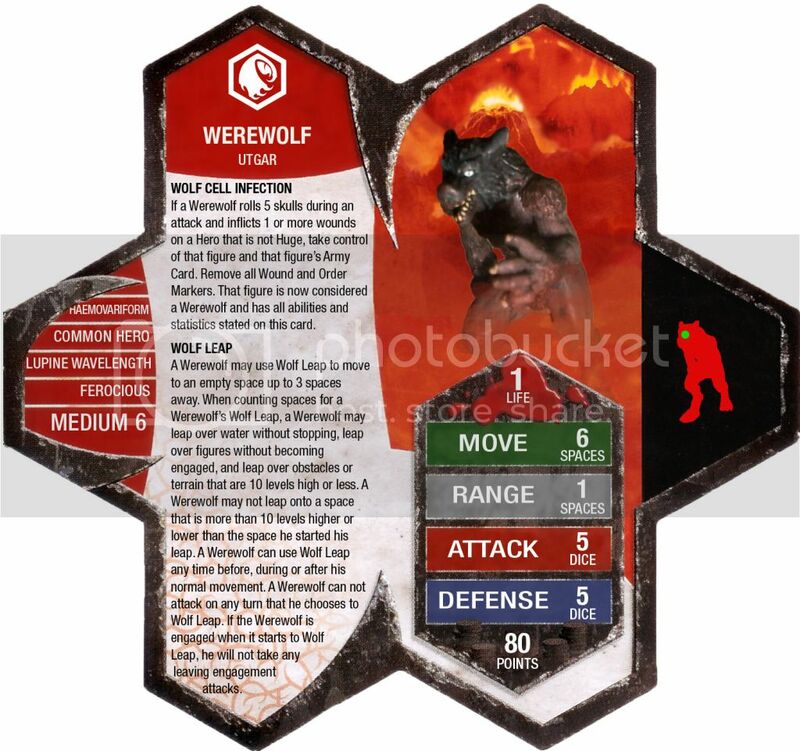 I'll admit I am struggling with this as this is their main thematic ability & it is already hindered by only targeting small or medium figures & by the fact that it is instead of an attack. It seems now a little wasted as the odds look better with your normal attack, which I really only envisaged being used against Large or Huge figures like a slow death. What about if I drop the normal attack to 4 would I be able to bring the E3 percentage to 30% (still keeping the range at only 3? By the way the figures I got at Myers (here in Australia). They are actually call Doctor Who Micro-Universe. That is starting to sound better. I know how tough it is to drop abilities that just fit so well. I am working on a line of figs from Celtic mythology and have had to drop several abilities from numerous characters that would make them so broken. I know the E3 doesn't seem as powerful but considering it has a range of 3 versus Grimnak's range of 1 and you get 2 chances per turn to use it, it is still very powerful. Making it "instead of attacking" is a good balancing factor. Remember, since this is a squad, especially a common squad, you want to get the points as low as possible (while still keeping the theme going) in order to make them draftable (or is it "draftible"?). You may even want to consider dropping their defense a point or 2 as well. 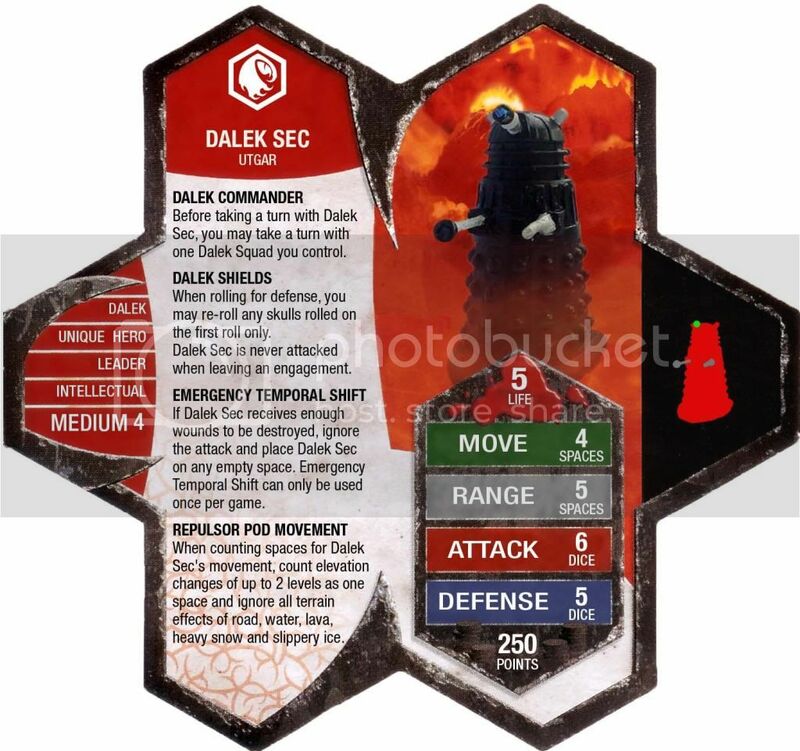 With Dalek Shields a defense of 4 would still be a formiddable defense. 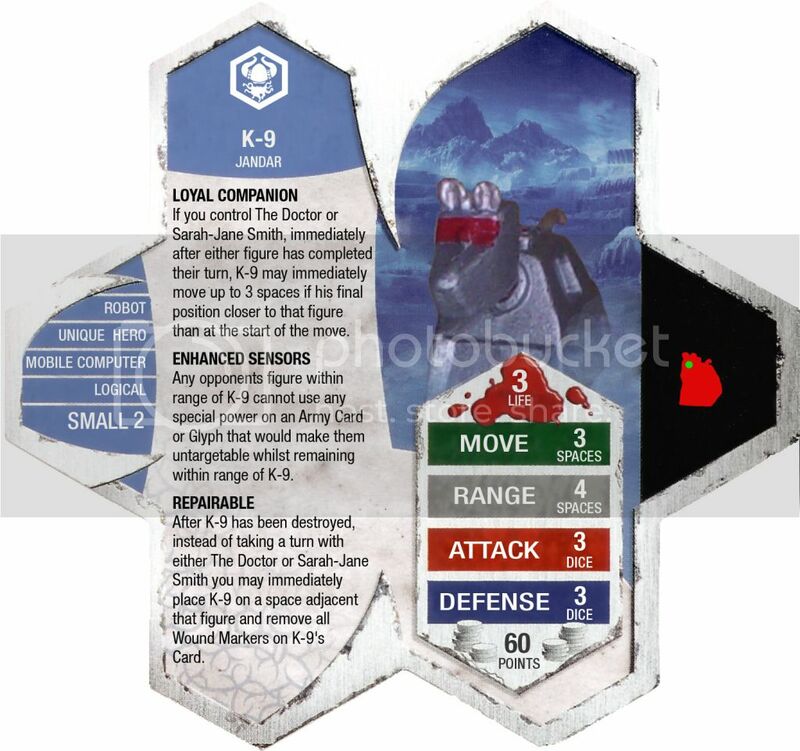 I know in the show they are practically impervious to almost all forms of attack and a defense of 6 with Dalek Shields is fitting, but for HS it is pretty high up there. Keep in mind I am an amateur, at best, when it comes to customs. So, take what I say with a grain of salt and definitely seek a second opinion. I can't wait to see your other Dr. Who customs! Last edited by Lamaclown; July 7th, 2009 at 11:48 AM.